Villa64 is 5 km from the airport, maximum 15 minutes with traffic. Villa64 has a privileged location as it is not noisy ans you will be able to have a good night sleep and also be able to visit main touristic attarctions by walk. We are 1.9km from Malecon 2000. We have a really nice patio with an open kitchen where you will be able to enjoy our breakfast and have a coffee or a glass of wine. 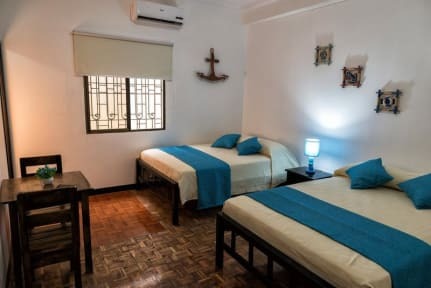 We also have a cable TV, free WIFI in communal zone and rooms and a computer at your disposal. Villa64 is located in Hurtado 808 entre Tulcán y Carchi. Just behind the Presley Norton museum. Two blocks from Malecón del Salado and the Hurtado street is parallel to 9 de Octubre street. Great Bed and Comfort, Great Breakfest, Great People, for me it was the perfect 1-Night-Hostel before I went to Montañita.